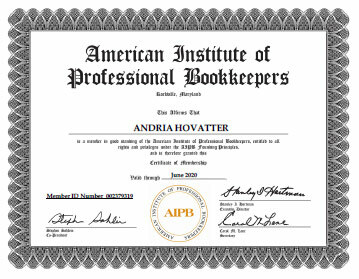 Ann started bookkeeping in 2008 and founded The Bookkeeper in 2010. In the beginning, our clients were referred to us from a local CPA, but over the years we have accumulated a strong and diverse client base through referrals from existing clients. We are the most knowledgeable bookkeeping team around. Combined, our team has over 34 years of experience in accounting. We are experts when it comes to the accounting routines that take place within Accounting software and can apply them to any set of financial business requirements. We never outsource your bookkeeping, so you can rest assured that you are getting our commitment to quality every time. We are The small business For small businesses. We believe that our client relationships are partnerships, and we will work with you to customize our services to fit your needs by letting you choose the level of involvement that is right for you. We are more than equipped to handle everything from A to Z, but we find that many of our clients like to be involved in the process to some degree, and we openly welcome that. Because our current work environment demands consistent and up to date information, we can work on your books as frequently as daily, as infrequently as annually, or any combination in between. Many of our clients choose either weekly or monthly services, but we will accommodate what works best for you.